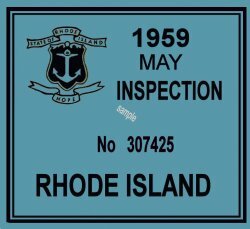 1959 Rhode Island Inspection sticker - $20.00 : Bob Hoyts Classic Inspection Stickers, Add a Final Touch to your Restoration! The first Rhode Island Inspections were probably started in 1947. This is the earliest known RI sticker. This 1959 inspection sticker was restored and reproduced identical to the original both front and back. For an additional $5.00 buyer can purchase a month of your choice. The back allows you to put your car information on it. For an additional $10.00 buyer can add your license plate number to the front of this sticker where the random serial number is now located.